When I say notebook, I am referring to the paper kind not the PC or Mac kind. I have a friend, also a writer, who I get together with from time to time to write with, chat, share creativity, etc. We were supposed to get together today actually, but I'm sick and wimped out (sorry Cate, we will get together again soon, promise). Anyway, whenever we get together, I drag along my laptop while Cate is much more partial to pen and paper. I type faster than I can write by hand, my hand writing is borderline illegible, and my ideas don't always come out in chronological order so I'm a big cut-and-paste user. It's so easy to go back, do a quick fix, then pick up where I left off. And herein lies the problem. My quick fixes tend to turn into an endless cycle of touching up and rewriting. This often leads to losing the thread of an idea before I get to the end of it. It's not that I don't have the ability to go back later, figure out what I was generally thinking and finish the story, but it never has the same momentum and flow that it did when the idea was fresh in my mind. Finishing the story becomes harder work. Sometimes this ends in the story being abandoned all together. 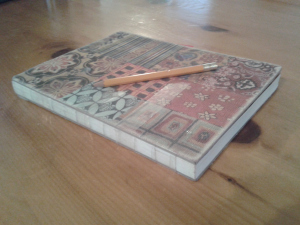 I've had the notebook for a while, but never really thought of it as a sit-down-and-write medium. It was more of a capture-that-random-thought-while-sitting--in the waiting room, in the coffee shop, waiting for the bill in the restaurant--kind of a thing. That collection of observations or ideas that I would come back to later when I needed a starting point or some inspiration. Sometimes though, with my computer not at hand, I have used it to capture more complete works. Blog posts, for example, have been drafted in the notebook on more than one occasion. And I've noticed something. Without the ability to cut and paste, delete and replace, etc, something miraculous happens. I forget all about it and just keep writing. I can always fix it later, when transposing to the computer, after all. With several incomplete stories sitting on my hard drive, I got to thinking: the notebook addresses my biggest weakness (or one of them anyway), my tendency to over think and obsess. On Friday, the beginnings of a story popped into my head while I was meditating. First of all, I resisted the urge to hop right up and deal with it (an important part of meditation practice, but that's a topic for another time). When the timer went off, I decided it was time to try a new approach (well, new to me). Instead of turning on my computer, I picked up my notebook. Then a miracle happened. I actually wrote a short story in one sitting. Ok, I got up to pee, refill my tea, and so on. But it was one writing session, let's say. Just under 2000 words, I think (guesstimating), so not a long one. The story needs a lot of work/fleshing out before I would dare submit it anywhere. It's not even worthy of letting my husband read it yet, but it's a complete story nonetheless. The momentum of the initial idea carried me to the end. It is captured. My mind can let it go and get on with the next thing. If you're having trouble (like me) with getting to the end of an idea without second guessing every word and punctuation mark along the way, I recommend giving the old-fashioned method a try. I personally prefer writing in pencil. It feels kind of like drawing to me and gives me the sense of pulling out my creativity all the more. Cate, on the other hand, has told me she has a favorite kind of pen she likes to use. To each their own. That's where things are this week. It felt good to finish something. We'll see what next week brings.